A forward looking company - still family owned - Delaine have refined today's transport offering across their routes by delivering journey times that compete with the private car, using attractively liveried smart modern buses with convenient and reliable timings, helpful drivers and modern contactless ticketing. Their buses have clear and comprehensive indicator displays and information is available both online and though easily read timetable leaflets available on the vehicles. This family business is long established in the market town of Bourne in the south of Lincolnshire, with six generations of the Delaine-Smith family having been active in the company. Bourne was also an important part of the British racing car scene in days gone by, and part of the Delaine garage premises in Spalding Road incorporates the site of the BRM works (British Racing Motors). Pre-war ERA (English Racing Automobiles) had been based nearby too. A BRM Celebration Day was held in the streets of Bourne in October 2012 to commemorate Graham Hill winning the Grand Prix in a BRM car in 1962. The Delaine business has origins that lie back in the 19th century. In 1890 William Smith used a horse and cart owned by his father Bennett to take Bourne folk to and from the Tuesday market in Spalding. Bennett had started in business about 1867 as a general contractor. A fire occurred at their depot in 1907 with sad loss of carts and horses. After William died in 1913 his son Thomas Arthur (1896-1958) married a Miss Emma Weston in 1915 who, through her family connections, brought the Delaine name to the business. Starting with taxis in 1910 Thomas acquired his first motor bus in 1919, PW1558, a 14-seat Ford model T bought for £495. Routes were established to Spalding via Twenty, Grantham via Corby Glen and Stamford via Greatford. In 1923 what was to become the main route from Bourne to Peterborough was started. For some years there was competition from Peterborough Electric Traction all along this route; in 1930 by agreement they withdrew north of Market Deeping although still serving the road south from there to Peterborough on their route from Spalding. With a fleet size of five the timetable for March 1928 for 'The Delaine Saloon Buses' showed a Tuesday journey to Spalding for the market, leaving Bourne at 9.45 am and returning from Spalding at 3.00pm. Stamford was served on Fridays, leaving Bourne at 9.45 am via Witham, returning at 2.45pm; an alternative journey left Bourne at 11.15am via Braceboro, returning at 4.00pm. Grantham was served on Saturdays, leaving Bourne at 9.15am and 5.30pm, returning at 3.45pm and 10.30pm. On the route southwards to Peterborough there were 8 journeys from Bourne Market Place to Peterborough Broadway on Wednesdays and Sundays, and 10 journeys on Saturdays; first departure from Bourne 9.00am (10.30am Sundays), last return journey 10.30pm. Subsequently this route terminated at the Cattle Market until Bishops Road bus station opened in 1937. In that same year the single fare from Bourne to Peterborough was 1/3d and the return fare 2/0d. At the time there was also a subsidiary depot in Brook Street, Peterborough, opened in 1932 and closed in 1939; this was primarily established to enable operation of tours and excursions from Peterborough, for which permission had previously been refused because of the distance of dead running to and from the depot at Bourne. A second disatrous fire occurred at the depot in November 1928 causing much damage and destroying several buses. This meant the cessation of the Grantham service. The business of W H Walpole of Dyke was acquired in 1932 and that of W H Haines of Deeping St James in 1934. A more direct route from Bourne to Stamford via Toft and Essendine came into operation after January 1937 with the takeover of the 'Betterway' service of Thomas Bett of Billingborough from Boston through Billingborough and Bourne to Stamford (the Boston to Bourne section passing to Lincolnshire Road Car, with whom Bett's business had been jointly purchased). In May 1941 the business became Delaine Coaches Limited. The bus services continued in wartime under often difficult conditions with the addition of workers transport to airfields in the area, including South Witham, Woolfox and North Luffenham. Over the years the business developed substantially (despite the two depot fires in 1907 and 1928) and has passed down through several generations of the Delaine-Smith family. 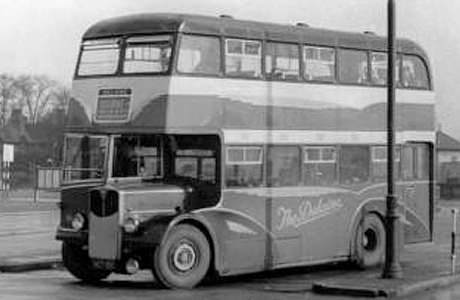 The first double-decker bus came in 1948; others were acquired through the 1950s. Delaine was to have experience of a rail replacement bus service in 1951 when the line closed between Bourne and Essendine. A daily bus was put on, running via Thurlby and Braceborough. However it incurred such losses that it was soon cut down to two round trips on Thursdays and Saturdays only, and those only between Bourne and Braceborough. Closure of the M&GN rail line through Bourne in 1959 brought further (mostly short-lived) rail replacement routes, although the last remained until 1999 in truncated form as a Thursday only journey from Greatford to Bourne. In 1961 over 1,100,000 passengers were carried by Delaine, of whom 420,000 were on the Peterborough route (at the time two-hourly in frequency, increased to hourly on Saturday). The bus station in Bourne opened in 1974 and a town service started in December 1975. An hourly frequency six days a week was introduced on the Peterborough route in 1976. For a number of years workers contract buses to factories in Stamford and Essendine formed an important part of the business but they declined as factories closed and the last such operation ended in December 1988. Route numbers were introduced in 1992. In 1993 the first vintage bus running day was held in Bourne. Mr Hugh Delaine-Smith (1920-1995) joined the business after leaving school in 1938, the son of Thomas Arthur and father of current Managing Director Anthony. Hugh was awarded the MBE for services to public transport in the New Year Honours List for 1995; sadly he died just two months later in March. 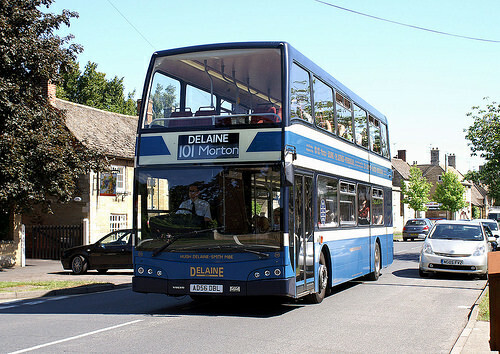 The company name Delaine Buses Limited was adopted in 1995 and the company's first low floor bus was acquired in 2000, a Volvo B7TL double-decker registration X7OCT. 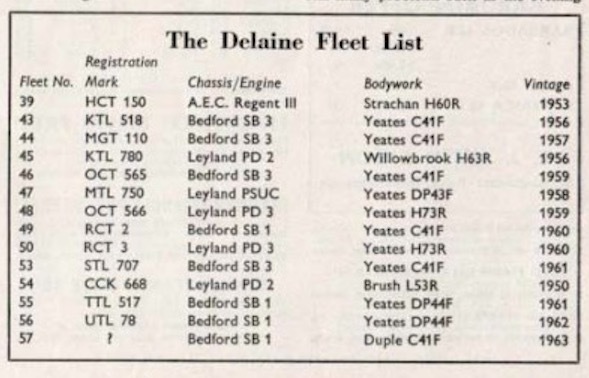 A cameo of the then fourteen vehicle Delaine fleet as it was in 1963 comes through information found in an article by David Kaye in a back number of Commercial Motor magazine, with six coaches, five deckers and three dual purpose saloons. KTL780 (45) and RCT3 (50) are still part of the Delaine heritage fleet in 2019. 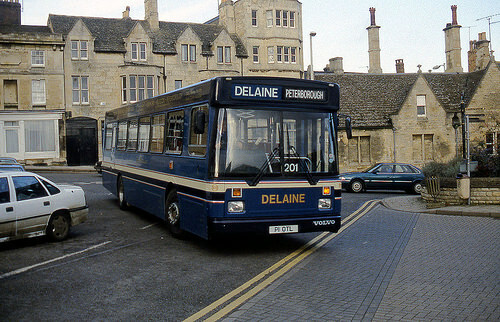 Delaine are in the bus business (coaching activities ceased in 1996) and their routes radiate today from Bourne to Stamford, Spalding and Peterborough, with the latter route the most important and operated nowadays at a half-hourly daytime frequency. The first double deck vehicle was introduced to the Peterborough route in 1948 and such vehicles still operate most of the busy 101 and 102 services today, albeit now one person operated, the last conductress having retired in 1987. Designated a New Town in 1967 the population of Peterborough (and the employment opportunities there) grew enormously from then onwards. The Peterborough route grew to an hourly frequency six days a week in 1976 and the present half-hourly headway came in 1996. The route was extended northwards on an hourly basis from Bourne to serve housing development in the village of Morton in 1999. Travel habits change so an earlier route northwards from Bourne to Sleaford became but a truncated Thursday market day and school times type operation running as service 301 as far as Rippingale (but extended to Billingborough again in 2013 as Kimes withdrew from the road). From 1961 to 1980 the Bourne to Sleaford route was unusual in being jointly operated with Lincolnshire Road Car service 34, thought to have been one of the first - if not the first - joint operation between an independent and a state-owned company. This initiative saved Road Car outstationing three vehicles overnight in Bourne. After withdrawal of the joint operation Delaine maintained a two-hourly headway for some years on the section from Bourne to Billingborough. Similarly atrophied is the previous route from Bourne westwards towards Grantham, now just a school run to Corby Glen. Another route (201) links Peterborough with Stamford via Barnack and was introduced in 1988 when Barton Transport closed their local depot and withdrew from the Stamford area (Barton had in turn taken over Cream Buses of Stamford in 1961). At that time Kimes of Folkingham introduced an alternative replacement service between Stamford and Peterborough on another route via Wittering. 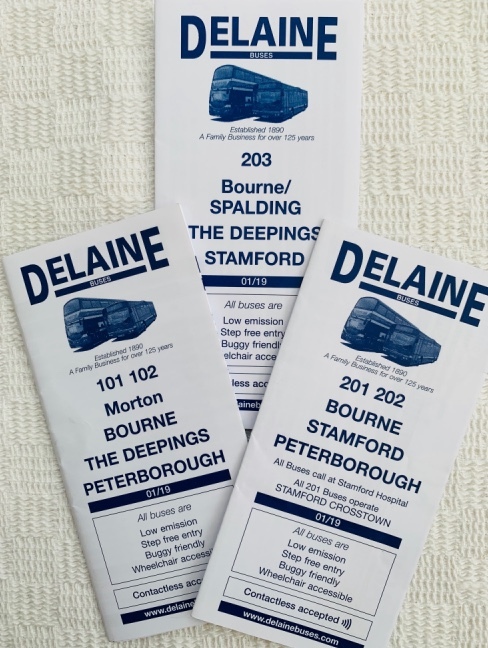 Delaine's other routes from Stamford are the 202 which provides the hourly link to the home town of Bourne by way of Essendine and Toft, whilst the 203 runs from Stamford to The Deepings, extended at school times to Bourne. Falling passenger numbers saw the withdrawal of the Bourne town service at the end of March 2008 after thirty-three years operation. The busy Delaine 101 route from Peterborough Queensgate bus station to Bourne continued half hourly and was enhanced to three times an hour on the southern section between The Deepings and Peterborough (route 102 called affectionately The Deepings Flyer) when Stagecoach withdrew their long standing hourly service over that part of the route in April 2011. Midday commitment for the principal services would appear to be about twelve buses. A substantial number of extra and duplicate journeys are needed on the regular routes to cater for schools and college traffic, including no less than fourteen buses serving the afternoon outmuster at Bourne Grammar School. Almost uniquely in the second decade of the 21st century the operation is 100% commercial without council support subsidies - a proud achievement reflecting the dedication and attention to detail of this successful family business. In 2006 the fleet size was recorded as twenty four, of which no less than eighteen were double-deckers. The sixth generation of the family came into the business when Jennifer (great-great-granddaughter of Thomas) joined the firm. The Delaine fleet in summer 2012 numbered twenty one vehicles - of which sixteen were double-deckers, some of which carried names. In 2015 the fleet size was twenty seven, many carrying DBL registrations. All are of Volvo manufacture and nineteen are double-deckers - plus another three Leyland double-deckers in the heritage fleet (the museum to house them will open in spring 2019). Changes from mid-January 2016 saw routes 201 and 202 combined to give a through bus every hour on the Bourne - Stamford - Peterborough route, also improving connections within and across the town of Stamford. October 2018 saw the addition of a new route 205 between Stamford and Peterborough via Wittering, replacing Centrebus route 9, whilst January 2019 saw service 203 from Stamford to the Deepings extended onwards to Spalding, creating a new connection across the county. Current fleet size is thirty, all Volvo chassis, comprising twenty three double-deckers and seven single-deckers (the latter primarily used on the Stamford routes). On the occasion of the Delaine one hundredth anniversary in 1990 a book was published in celebration. 'The Delaine, history part two, 1983-1990', by the current Managing Director Anthony Delaine-Smith. This followed the earlier volume 'The Delaine, history 1890-1982', written by A L Baker. Both include many photos and a full chronology of the company, its bus services and development. A third book - 'Delaine, 120 years of service" - by Peter Moore brings the story up to 2010. 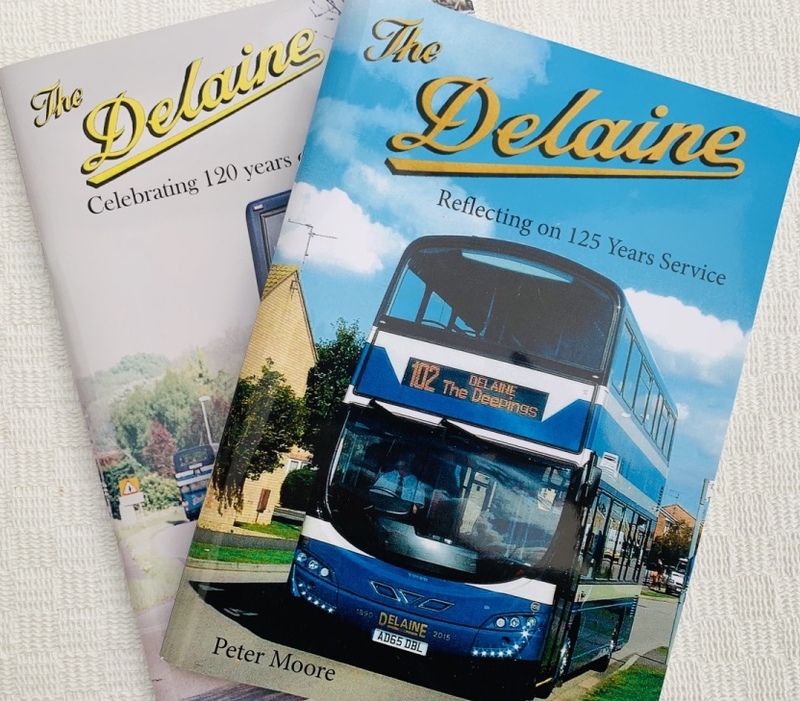 Then a fourth book brings the story up to date with the '2015 Fleet Handbook' from Steven Knight Media, whilst autumn 2015 saw the publication of a fifth book, again by Peter Moore: 'The Delaine - Reflecting on 125 years of service'. More recently 'Buses Year Book 2019' contains a descriptive article too. For a while there was an ex-London Routemaster ALM59B in Delaine fleet colours, from 1992 to 2002. Numbered as 113 it was used for a variety of promotional purposes including attendance at rallies as well as occasional deployment on the usual bus routes. A departure from the old bus station in Bishops Road, Peterborough, which had been to the south of the town centre. This was replaced by the new Queensgate bus station in 1982 when the modern shopping centre was opened by Queen Beatrix of the Netherlands. Peterborough was designated a New Town in 1967 and its population more than doubled between 1971 and 1991, from 69 thousand to 155 thousand. It became significantly more important economically as a 'travel to' destination, with the benefit of increased bus services. Apart from improved facilities at the new bus station it enabled the end to end running itme of the Bourne to Peterborough route to be shortened, leading to better operating efficiencies and an increase in one-man operation. 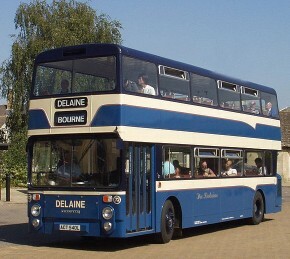 The Delaine website with timetables, history, fleet list and gallery. 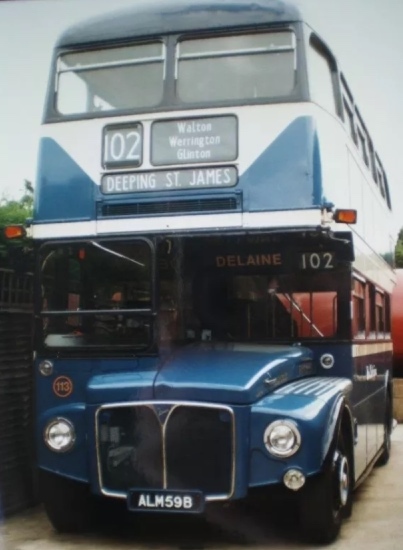 Delaine Heritage Trust will celebrate 100 years since the first Delaine motor bus 1919 - 2019.
found in the libraries of Lincolnshire.